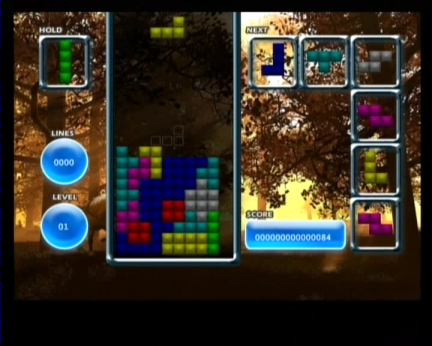 TetWiis (Copyright ©2010 Pembo.co.uk) is a Nintendo Wii homebrew clone of the falling blocks classic – Tetris. Shamelessly based on the popular Nintendo DS version! The more lines you get, the higher the score rewarded, but the faster the game gets! For every 10 lines you clear the level increases, along with the scores rewarded and the speed of the drop! More score can be gained by going for the risky double, triple or quad clearances, and you are rewarded highly if you successfully attempt the ultimate back to back quad clearance! You’ll recognise this as the classic ‘marathon’ mode of Tetris – play till you drop or run out of luck! TetWiis is freeware, can be distributed freely and should never be charged for. The latest version of TetWiis can be downloaded from here or from the download page and is also available to install via the HomeBrew Browser! Implemented clockwise/anticlockwise rotation of the blocks. Button (1) on the wiimote and (b) on the classic controller now rotate anticlockwise. Fixed the DOWN press release timer to give you a small amount of time before the key repeat kicks in again. Like the game? – Buy me a beer?